Yesterday, co-coordinated rallies across Australia led thousands of school students to protest in almost 30 cities and towns about the need for our government to do more to combat climate change. Media coverage has, for the most part, celebrated this event, praising the students for their passion and their youthful idealism. On one level, sure, it’s encouraging to see young people engaged in politics and demonstrating genuine conviction about a cause that undoubtedly affects them more than any other constituency. They will, after all, live with the consequences of inaction and be left to clean up the mess of current and previous generations. So, well done. They have right and justifiable reasons to speak up. But, and it’s a big but: implying and selling the idea to students that addressing climate change is simple and straightforward is dangerous. What we saw yesterday was an explosion of youthful passion and exuberance, but when the dust settles, the truth is that simple solutions to climate change just do not exist. It was this humility, this awareness that what seems straightforward is not, that was missing yesterday. Urged on by flattering commentary that paints them as smarter than our current crop of politicians, some students crossed the line between protest and disrespect. 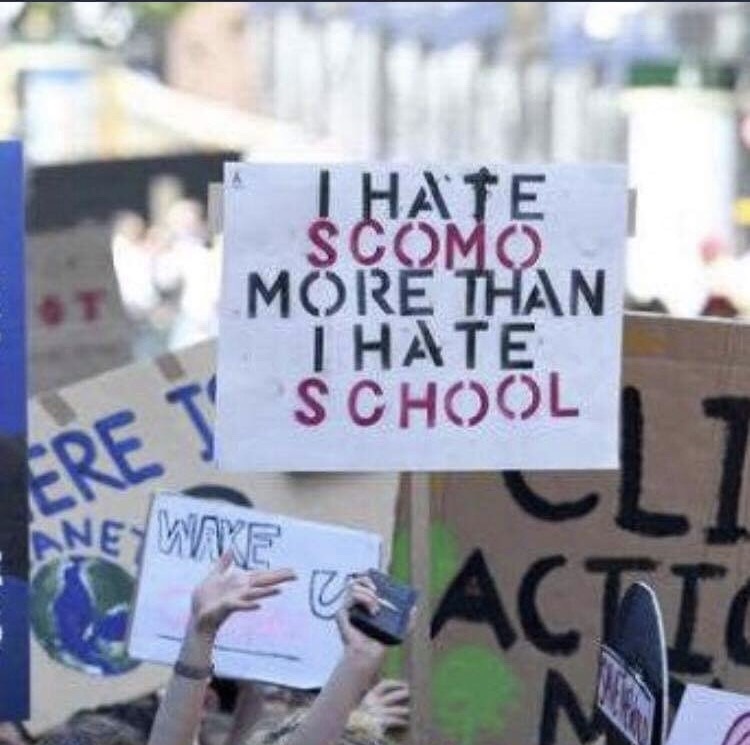 One child proudly carried a banner proclaiming “I hate ScoMo more than I hate school.” Whatever your opinion of our Prime Minister, is it ideal to encourage and celebrate such blatant disrespect for office, whether it be Morrison, Shorten or otherwise in the Lodge? Around the globe, leaders have struggled to find solutions to one of the most pressing issues of our time. Witness the 2009 failure at Copenhagen and the non-committal weakness of the Paris Agreement. It is not just the Morrison government that lacks a clear narrative on this issue. Sure, we’d love to transition to 100% renewables, as many students advocated for yesterday, wishing to see every last lump of coal stay buried deep in the ground. But that cannot happen overnight. If it was to happen, they would quickly find the disruption to things they take for granted incredibly hard to deal with. It is fairly simple to grasp the notion that ‘something must be done’ about climate change, but one wonders if consideration of the various difficulties and complexities is really understood. The Adani coal mine is a case in point. There’s no doubt it will have a negative impact on the environment, but denying the shipping of coal to India also leaves millions of people without access to affordable energy in a developing nation. So there’s a social cost too. Coal might be dirty and disruptive to the environment, but we also rely on it, and that will not and cannot change overnight. The fact of the matter is that governments around the world do not have all the answers, and neither do teenagers and children pontificating on the street. In Canberra, it is not surprising that the Greens celebrated this event as a remarkable testament to the future, finding kindred spirits in six year olds, but the reality is that climate politics and genuine change will be complex, difficult and incredibly disruptive. To be humble is to be aware of one’s limitations and to acknowledge that they don’t have all the answers. Our media should take note. Passion and zeal is one thing, but meaningful action on climate change is going to require much more than that.